We like to keep you up to date on all the latest news regarding Garden Groom. This page shows all the latest news and features, below are a few examples of published articles. Garden Groom has outlets all over the world, please email us here for any further information. Good Morning America – Infomercial products: Which is the top performer? Our new products (1MB Word Document). 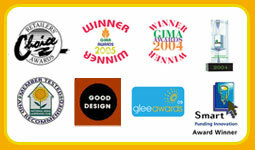 GARDEN GROOM are delighted to announce their most recent award, GLEE 2009 New product award. Glee, the UK’S premier Gardening show held it’s annual competition to find the year’s most innovative new garden products, with GARDEN BARBER picking up….Best New Garden Machinery product 2009! What a wonderful invention: the ergonomically designed Garden Groom hedge cutter trims your hedge with it's big rotary blade, and collects all the cuttings in the bag that comes with it so that you don't have to sweep up afterwards - the most labour-intensive part. 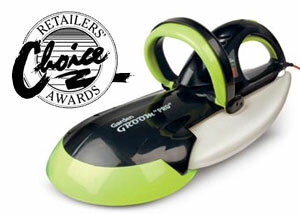 At the National Hardware Show in Orlando, Garden Groom was awarded the “Retailers Choice Award”. With only 22 winners out of thousands of products on display at the show, this is quite an accomplishment. The winning products will be featured in the July issue of Hardware Retailing. This Morning feature Garden Groom with David Domoney. "With Autumn upon us, it’s a great time to get out and buy some garden gadgets that will make the winter months in your garden more enjoyable. The Garden Groom has a unique collecting system which makes the chore of hedge trimming far simpler. As you cut, none of the waste is left on the floor, thus saving you time and effort. This shredding action reduces the waste volume by 10:1, making disposal a far simpler task, especially when cutting thorny or spiky growth." "Top-end, luxurious, powerful play things to make	gardening child's play - and a joy to do." Mail on Sunday article 15/07/07. 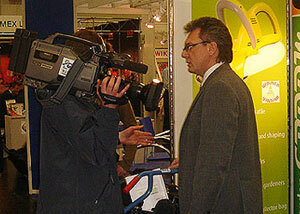 "Midi" creates great interest at the Practical World Show in Cologne. Garden Groom was delighted to launch its new product, the "Midi" at the recent Practical World Hardware and Garden show in Cologne, Germany. Their attendance created tremendous interest from potential buyers and the global media. Literally 100's of show attendees visited the booth, which resulted in a large number of potential new markets and customers for both products. A large contingent of TV, Press and Trade media also visited the booth, ensuring positive exposure for the Garden Groom brand. Garden Groom featured on “I want that” USA. US show 'I want that' featured Garden Groom on one of their recent programes. You can see what they said by playing the movie at the top of the screen. 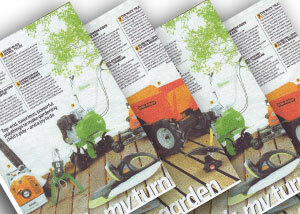 'Midi' voted 'Best Buy'­ Garden Answers magazine. 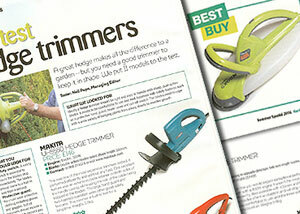 In their latest edition (June 2006), the highly popular and well respected Garden Answers magazine tested 11 of the UK¹s most popular hedge trimmers and voted the Garden Groom "Midi", 'Best Buy', for it¹s unique features, performance and ease of use - praise indeed ! Centre stage at Gardeners World live on 16th June 2006. Garden Groom was showcased at the recent BBC Gardeners World Live Show and was featured on their T.V. 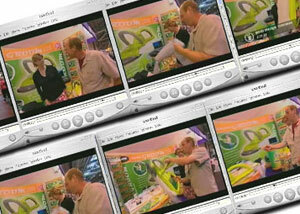 program that aired on 16/06/06, highlighting "environmentally friendly" gardening products. Due to it¹s unique shredding facility which gives a 10:1 reduction of waste, clippings can be utilized in an "eco friendly" way, either as mulch or compost. From the United Kingdom, the "home of the hedge", comes a forward-thinking innovation for the gardener in everyone. On April 1st, Apollo Exports will introduce to America the Garden Groom: a revolutionary hedge trimmer that cuts, shreds, and deposits into a unique collection unit. The Garden Groom (www.gardengroom.com), created by inventor Graham Wilson in 2002, boasts a concealed blade for the ultimate safety and a volume collector bag for larger hedges. Fully embraced by the UK when it launched in 2004, the Garden Groom is available in two sizes; the larger more powerful Max with a 12" cutting head for large hedge runs and the lighter easier to handle Midi with a 9" cutting head for the average to small hedgerow (created for the everyday gardener and due to it's light weight and versatility, particularly suitable for seniors and women). Hedge trimming and shaping has never been so quick, easy, safe, or fun! Graham Wilson, Inventor of the Garden Groom, says: "I created the Garden Groom for myself because of my frustration with hedge trimmers. I disliked the exposed blade for safety purposes, and hated cleaning up all the waste after trimming. I solved these problems in the Garden Groom's revolutionary design, and I look forward to sharing my solution with gardeners in America! " The Garden Groom was introduced in the UK in 2004 to rave reviews and won the GIMA (Garden Industry Manufacturers' Association) Award for UK's "Best Gardening Product 2004" and "Exporter of the Year 2005" - the equivalent of the UK Gardening Oscars. It has already featured on the BBC's "Tomorrows World", Popular Science's "Best of What's New 2003" and Best Inventions programs, as well as the Discovery Channel's "What's the Big Idea?" With the sales of hedge trimmers in America reaching six million units annually, Garden Groom is confident to find success in this market. Currently, the Garden Groom enjoys over 5% of total UK market share for hedge trimmers, an astounding percentage for a recently introduced product only one year in the market! The design of the Garden Groom is truly innovative. Vibrant fluorescent green hues are accented with a grey circular blade cover, a large footprint which helps to create a consistent, smooth hedge length throughout the trim. The Garden Groom safety features includes a two handed handle design in order to activate the unit and a totally concealed blade to eliminate the fear factor associated with conventional hedge trimmers. The Garden Groom's unique shredding action reduces the clippings by 10:1, making disposal a far simpler task, especially when cutting thorny or spiky growth. The Garden Groom Max cuts, mulches, and contains clippings in the proprietary Garden Groom fashion. Retailing at $199 and featuring a 430 watt motor, the Max's strong blade cuts up to 0.6 inches diameter and holds 8 square yards of clippings. Suitable for larger hedge runs/properties, it also comes with the Volume Collector Bag, which holds 70 square yards of clippings to be turned into mulch or compost, and weighs 9.1 lbs. The Midi is the newest Garden Groom, and also cuts, shreds, and contains clipping in the proprietary Garden Groom fashion. Retailing at $149 and featuring a 300 watt motor, the Midi is ultra lightweight (6 lbs.) and versatile, and ideal for trimming and shaping smaller hedges and bushes. The lighter design is particularly useful for women / senior gardeners, and the Midi's strong blade cuts up to 0.4 inches diameter. It also comes with the Volume Collector Bag to hold clippings and aid disposal. There are no upcoming events, please return soon for further information.